Montgomery County Court Records. In council 28 April 1778. Capt. Jonathan Isom’s Company, division Role – Abram Goad, Randolph Lawson, Robert Lawson, Robert Lawson Jr., James Goad and James Goad Sr. In Reuben Lawson’s Revolutionary Pension application file on the 17 June 1833 in Monroe County, Tennessee he indicated he was 73 years old and born about 1760 in Pittsylvania County, Virginia (however, Pittsylvania was not formed until 1767, so may have been born in a part of Halifax that later became Pittsylvania County, See Map of 1751-1760). When first called into service as a private in 1776, he was living in Pittsylvania County, VA and remained in Virginia a year or two after the Revolutionary War when he moved to Hawkins County, TN where he lived until about 1825, when he moved to Roane Count, TN and then in March 1833 he moved to Monroe County, TN.In 1780 he was living in Montgomery County, VA when the militia company he belong to was required to finish 8–10 men (and he was one of them) to join others to march against Cornwallis at Salisbury. His officers were Captain William Bobbitt and Lt. Benjamin Baily during this call up. In late 1781 or 1782 he was draft again in Montgomery County and served as a private under Lt. Benjamin Baily and they started from Montgomery County where he lived and marched to Long Island on Holston, in what is now Sullivan County, TN to meet the Indians. He remained there until Col. Campbell’s troops returned to release them. 1782 Montgomery County, VA Personal Property Tax Records. Randolph Lawson applied for a pension on an application executed 28 April 1835 while he was living in Johnson County, Illinois, stated his age was 82 years and born in Cumberland County, NC in the fall or winter of 1752 [Cumberland County was formed from Bladen County in 1754]. That he entered the service for 3 months in the summer of 1780 in Cumberland County, North Carolina where he was raised. Named his officers as Capt. Cox and Col. Knowles and was at the Battle of Camden as a guard of the baggage. Volunteered again in January or February 1781 and mention a Capt. Duck and was at the Battle of Guilford Courthouse, but being young was again on detached duty as a guard of the baggage. Each time he was discharged, he returned to Cumberland County, NC. After the war he moved Cumberland County to Patrick County, VA, thence to Montgomery County, VA, thence to Campbell County, TN and thence to Johnson County, IL. The claim was rejected, as he did not furnish sufficient proof of six months military service as required by the Act of 7 June 1832.He made two further amended applications while living in Clinton County, Kentucky, 27 June 1838, and again 18 May 1842, and the depositions, for his conveniences, were taken in Fentress County, Tennessee, since he was living on the Kentucky/Tennessee state line. Stated his age in 1838 was 84 years and in 1842 was 90 years. Mentioned he moved to Illinois with his children, but gave no names and after being there a while became sickly and decided to move back to Tennessee but on his way he decided to settle in Clinton County, KY immediately on the Fentress County, TN line about sixty miles from the settlement in Campbell County, TN that he had lived in. He named other officers, a Capt. Gholston and Capt. Gordin but believe the second one was an officer his father had served a tour of service with but did not give the name of his father. Also indicated he had a brother, John Lawson, who lived in Morgan County that served with him but that his brother was now dead. Again mention that after the war he removed from Cumberland County, NC to Stokes County, NC, afterwards to Henry County, VA, thence to Montgomery County, VA, thence to East Tennessee – Hawkins County, there had his house burned and all his papers destroyed, thence to Campbell County, TN, stayed there upwards of twenty years, left there in the fall season of 1832 for Illinois.The age of Randolph is in question in that he stated in his depositions that he was assigned as a guard of the baggage because of his age, which implies he was very young, maybe a teenager or very earlier twenties? If he was born in the fall or winter of 1752, then in 1780 he would have been 27 or 28 years old, which is not that young for a soldier in the Revolutionary War. In documents filed in Fentress County, Tennessee, 21 May 1840, in support of Ann Lawson, his brother John’s wife, he stated he was two years younger than his brother who was born about 1755. This would make his birth date 1757. It is not unusual for people of this period to inflate their age for a number of reasons, one that they just did not know how old they were. Virginia State Land Office, Land Office Grants Z, 1785-1786, page 55, Reel 66, Montgomery County, Virginia, 145 acres on Sugar Run a branch of Little River waters of New River. At a court held for Montgomery County, Virginia, 24 August 1786, William Lawson was appointed Lieutenant in Captain Lorton’s Company of militia. 1787 Montgomery County, VA Personal Property Tax Records, Bird Smith’s District. August 14, Lawson, Reuben, paid no tithes, 2 horsesIn another list of persons charged with tax in Montgomery County for 1787 who have removed before same could be collected, Bird Smith’s District. It indicated Reuben had removed to North Carolina. William Lawson Jr. married Nancy Baker, 4 January 1788 in, Montgomery County, Virginia. Witnesses were Travis Lawson and Thomas Mallett. Travis Lawson married Martha ‘Maysis’ Simpkins, 4 January 1788 in Montgomery County, Virginia. Witnesses were William Lawson and Thomas Mallett. William, Travis & William Sr.
1788 Montgomery County, VA Personal Property Tax Records, Bird Smith’s District. Montgomery County, VA, Court House, Entry Book c, page 105 – July 7, 1788 – William Lawson assignee enters 105 acres of land lying on Sugar Run a branch Little River on the south side thereof beginning at his corner black oak and white oak to run up the north side & various courses for quantity. Randal, William Sr., Travis & William Jr.
1789 Montgomery County, VA Personal Property Tax Records, Bird Smith’s District (some of these taxes were paid in 1790). 1789 Montgomery County, VA Personal Property Tax Records, James Newell’s District. William Canterbury married Betsy Ann Lawson, daughter of William and Rebecca Lawson, 3 August 1789 in Montgomery County, Virginia. Location of residences of taxpayers in 1789 Bird Smith’s District. Randal was located in the area of Greasy, Burks Fork and Reed Island Creek. Also in this area were Abraham Goad, James Goad and Jonathan Isam. 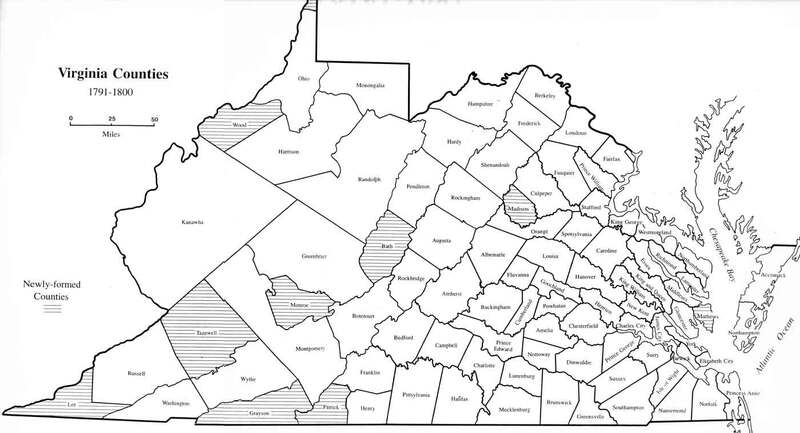 This area is located in Carroll County, Virginia between Hillsville and Dugspur. Location of residences of taxpayers in 1789 James Newell’s District. Drury was located in the area of Little Elk Creek, Powder Mill Creek, Beaverdam Creek, Elk Creek…about 5 miles from mouth. This area is now located in Grayson County, Virginia near New River. Montgomery County, VA, Court House, Entry Book C, page 203 – February 20, 1790 – William Lawson assignee of James Hines enters 200 acres of land on sugar run branch of Little River joining the land he lives on & on the north side thereof & running a north course to Tarepine Run. William Sr., Travis & William Jr. Location of residences of taxpayers in 1789 Bird Smith’s District (paid in 1790). The area William’s group and James Simpkins were located is both sides of Little River and Sugar Run and on the county line of Montgomery and Pulaski Counties, near of Graysontown. Virginia Land Office Grants No. 27, 1792-1793, page 511 (Reel 93) indicates William Lawson on 15 February 1793 received a land grant for 200 acres on Sugar Run waters of Little River, Montgomery County, VA adjoining the land he lives on. Henry Lee, Governor of the Commonwealth of Virginia, signed the grant. This was the land surveyed for him in 1790. Robert Lawson married Anna Goad, daughter of Abraham and Anne (Ayres) Goad, 1 August 1793 in Montgomery County, Virginia. From William Lawson – A Scottish Rebel. William Lawson sold his 345 acres of land on Sugar Run (now part of Pulaski County) to Eliazer Cole for 300 pounds. John Lawson and Elizabeth Davidson were married 22 April 1767 in Montgomery County, Virginia. May 16, Lawson, Robert, 1 white male over 16. June 24, Lawson, Travis, 1 white male over 16, 1 horse. May 15, Lawson, Joshua, 1 male over 16, 1 horse. Thomas Lawson and Jane Aul were married 9 July 1805 in Montgomery County, Virginia. Surety put up by John Aul. April 8, Lawson, Travis, 1 white male over 16, 2 horses.